Automating Windows 7 deployment can be easily realized through AOMEI Image Deploy which is a free image deploying tool, supporting Windows 10/8/8.1, etc as well. Automating Windows 7 deployment is usually required when we need to deploy Windows 7 image files to multiple computers in a same LAN simultaneously. Some people might consider of creating bootable CD/DVD to restore computers one by one. But what if there are twenty, fifty, or more computers? Then it should be a very arduous task, let alone those different hardware configurations. In this situation, AOMEI Image Deploy (AID) can solve the problem easily. It is a free Windows deployment toolkit that enables you to restore images to multiple computers through network in a LAN as mentioned before, even with dissimilar hardware. Not only Windows 7, AOMEI Image Deploy supports both 32 bit and 64 bit of Windows 10/8/8.1/XP/Vista/Server 2003/2008/2012/2016 too. Above all, you should have the image file of course. If there’s no image file, it’s possible to use free disk imaging software for Windows 7 - AOMEI Backupper to create one for system or disk. Check the cable connection between server and client computers. Make sure they are in the same network segment in a LAN. 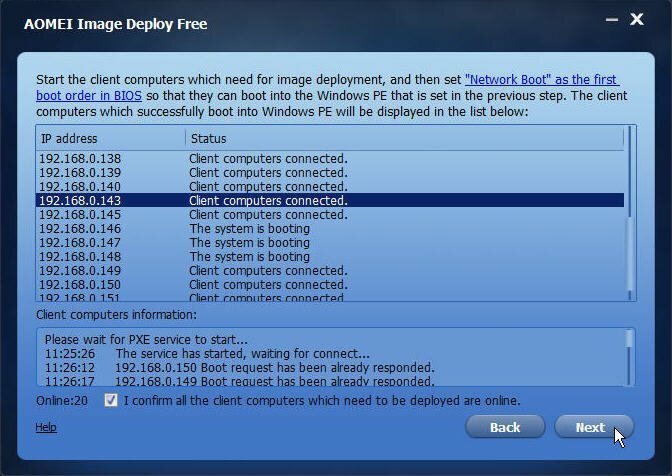 Ensure client computers are connected to the LAN and the network card of client computer supports PXE boot (Almost all computers support the option of PXE, you can go into BIOS to set up). Verify that the sequence number for installing system in client computers are same (for example, install systems to disk 0) in order to avoid the data loss caused by installing system to other hard drive (you’d better keep the disk for installing system only). Please confirm Windows Recovery Environment in the server computer system is complete. If your system is older than Windows 7, please download Windows AIK. After preparations done, you can download, install and launch AOMEI Image Deploy to start automating Windows 7 deployment. Step 1: Two methods are available to create a bootable WinPE ISO file. There may be a chance that drivers are incompatible with your hardware so that WinPE can’t start up client computers. In this case, Create bootable WinPE ISO manually is suitable for you. Tips: There should be one and only one DHCP server within LAN to make AID work normally. If no DHCP server exists in your LAN, you can tick Enable DHCP in the bottom. Meanwhile, the booting progress of each client computer (defined via IP address) will display on AID. Local IP, server IP and connection status will be also displayed on the client computer. When all client computers are connected to AID service, tick the box as the picture shows above then click Next. 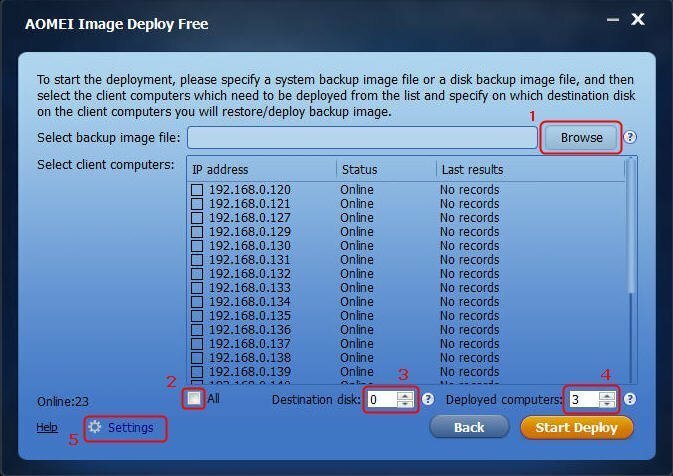 Step 3: Here you’re able to specify the image you intend to deploy and configure how to deploy it. 3.1: Browse the image file you’ve prepared. 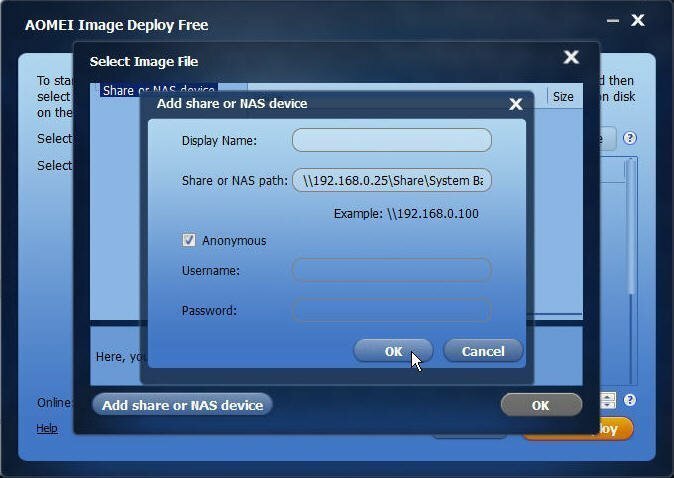 Click Add share or NAS device. In the pop-up window, enter the network or NAS path where the image file is stored. Select the image you want to deploy. 3.3: Input destination disk number to deploy the specified backup image. If there is only one disk in the computer, it is 0. If you are not sure, please remove other disks. 3.4: Decide how many computers will be deployed each time. Please note that the more you input, the slower the program runs. 3.5: In settings, you can set computer name, IP as well as Universal Restore for the sake of dissimilar hardware. Step 4: ClickStart Deployto execute. The whole process of automating Windows 7 deployment is not that difficult, isn’t it? Generally, if you face a deployment for a large number of computers. 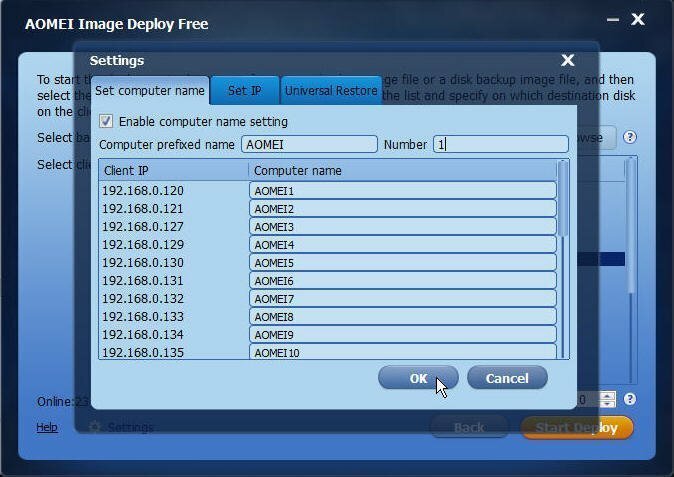 Among numerous Windows 7 deployment tools, AOMEI Image Deploy could be your ideal choice definitely.